ForeFlight’s Connect platform continues to expand to include L-3’s Lynx line of ADS-B products. 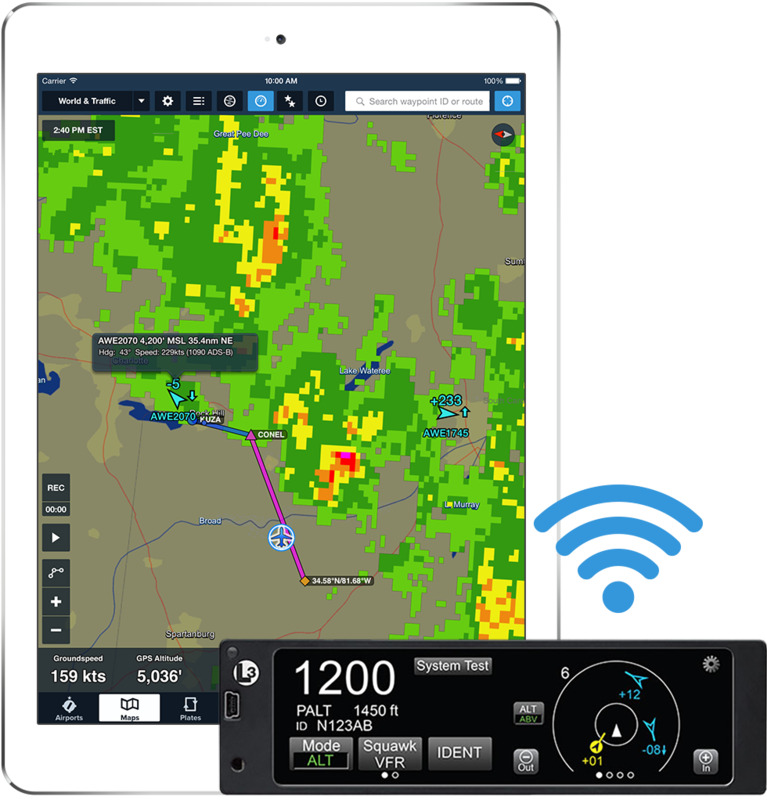 ForeFlight customers can connect wirelessly via Wi-Fi to L-3’s Lynx NGT-9000, -2000, and -2500 models to receive ADS-B traffic and weather and GPS data in ForeFlight. The NGT-9000, -9000+, -9000D, and 9000D+ all-in-one transponder solutions replace your current transponder to provide FAA mandate-compliant Mode S Extended Squitter capability with an embedded WAAS GPS. Lynx NGT-2000 and -2500 models also work seamlessly with the ForeFlight app and provide a low-cost 978 MHz ADS-B solution that integrates with legacy transponders. Click here for L-3 Lynx pricing and availability. All ForeFlight subscription plans include avionics connectivity. Once you connect your iPad or iPhone to the Lynx’s WiFi network, you can see details of the connection in ForeFlight Mobile in More > Devices (tap the L-3 Lynx box for additional information) and you can overlay ADS-B weather and traffic information on the Maps view using the drop-down in the upper-left corner of the screen. L-3 Lynx support is available with ForeFlight Mobile 7.7.2. You can check your app version at the top of More > About; if you don’t yet have version 7.7.2, you can upgrade directly by opening this link on your iPad or iPhone. This entry was posted in 2016 ForeFlight Year in Review, ForeFlight Mobile and tagged ads-b, foreflight connect, ForeFlight Mobile, L-3 Lynx by ForeFlight. Bookmark the permalink.